From the time we are little girls, twirling in our princess dresses, hope fills us that someday we will meet Prince Charming. And it continues into the tumultuous teen years when our hearts seem too big for our bodies, and we crush on that ONE guy whose every look in our direction, every brush of the arm in a crowded high school hallway, every word spoken (even if it is “excuse me, I need to get to my locker”) sends us into a dreamy state of wonder. What did he mean by that? It must have meant something to make my insides flutter so. Surely he felt the same, right? We feel deep things, sitting for hours at a journal, or filling the back of notebooks with poetry that opens doorways into a bleeding heart—a young, ripening heart that clings to the hope of finding the love we read in English class, between Romeo and Juliet, Heathcliff and Catherine, Elizabeth and Mr. Darcy. It may have been delusional on my end, but it kept the dream alive and helped me put up with all the junk of life. 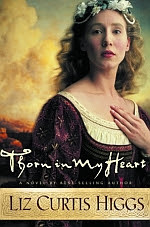 If ever a book was written to elaborate this vein with a deeper God-driven intensity, to thrust it into the hearts of women, not just girls, it is my favorite historical romance, Thorn In My Heart by Liz Curtis Higgs, the first in her Lowlands of Scotland series. I read it as a married woman, past all the stuff of love-sickness (I got my man :) ), but my soul was so rattled by the familiar hope of a woman in love in the story, it resonated to my very core. Set in 18th century Scotland, Higgs creatively weaves the Rachel, Jacob, and Leah story through the lives of her characters, Rose, Jamie, and Leana. Rose is vibrant, beautiful, and young, catching the eye and heart of Jamie. Leana is plain, sensible, calm, but with a beautiful heart, a God-fearing spirit. Through Leana, the vein of hope is established, urging the reader to ache for her, and hope alongside her as she yearns for Jamie's affection and courtship, and then love, once a proxy marriage set up by her scheming father, binds her to him for at least 7 months to produce a baby or end in divorce, and then Jamie can marry her sister Rose, who he is in love with. It is just after this proxy marriage that I would love to illustrate to you this theme of hope, even though it is ever present throughout the story. "My heart is spoken for. You may have the rest of me for seven days, but no longer." How heart wrenching to know that the man you've married doesn't love you back, and is only fulfilling his duty on the honeymoon because of your father's request? The only practical hope Leana has is for an heir to be produced to lock their marriage in permanency, and according to Jamie, only in the short 7 day honeymoon. "Hope," she said simply, settling into her seat as he shook the reigns and their journey began. "'Tis a basket full of hope." And from that first day of their honeymoon, the vein of hope woven through Leana's character tugs at the reader's heart, pulsating in and out of reach, as we catch glimpses of Jamie's teetering thoughts. Slowly, ever so slowly, Jamie contributes to the vein of hope in the eye of the reader, as well as in Leana's presence, thus growing it to a substantial hook for the reader to cling to for the rest of the book. She was not a beauty. Her face was too long, her eyebrows thickly drawn...But in the dark of the night, when she'd smoothed her hands across his chest and whispered his name, all those unappealing details had flown out of his head. Leana. He'd spoken her name once, not meaning to. She'd wept without making a sound even as he cursed himself for being careless, for giving her false hope. Heaven knew she'd brought enough of that in her cone-lined basket. Without hesitating, Jamie slipped his arms around her waist and pulled her against him to keep her from falling onto the muddy street. He held her only for a moment until she righted herself but long enough to flood his mind with vivid images. His resolution to make her bridal week a miserable one was crumbling like Neda's shortbread. "But you've looked at her." More than you know. More than I should. He kept his voice even. "No more than necessary, for politeness' sake. She is my wife, if only by law--"
There are moments of Jamie tripping up on the bounds of marriage in flirtatious bouts with Rose, even calling out her name in his marriage bed with Leana, but through the devastation this brings not only to the character, but the invested reader as well, Leana is steadfast in her grip on hope as she remains firmly rooted in God's love. Curled up in her bed, in a lonely corner of the house that creaked in the stiff breeze and groaned from the cold, Leana warmed herself with her prayers. "Almighty God, do you see me? Do you see my emptiness?" The wind moaned but did not speak. "Fill me with his child, Lord." She whispered into the dimly lit closet that was her refuge, her eye on the window that looked toward the heavens. "Let a son be growing beneath my heart. Maybe then Jamie will love me." I don't want to spoil the ending to this amazing book by Higgs, it is just too good. ;) But as I think back on the romance of the book, why it intrigued me so, what it taught me about writing a successful and long-lasting story in the eye of the reader, I find that my heart was hooked along the long, swelling vein of hope internalized in the characters and eventually blooming into their journey. This book sounds amazing! Thanks so much for the review. I remember all to well the desperate hope I had for certain boys when I was a teenager, the ones who only spoke to me to ask to borrow a pencil. Ah, nostalgia! This book rips at my heart like few books ever do. It's haunting and sweet all braided together. The reader 'feels' so much for Leanna - and that's the soul of Liz's great writing here. It is amazing, Rachel! Thanks for commenting! And yes, Pepper, haunting is a good word for it...I couldn't stop thinking about it for days afterwards...I felt like I was best friends with Leana and Jamie. Wonderful writing by Higgs!!! Wow, this sounds beautiful, Angie! You have me hooked and I really want to read this! I haven't read Liz Curtis Higg's series, but I can relate to the hope, longing, and then the fulfillment of true love and God's love. Excellent post, Angie! I haven't read that book, but it sounds like a must. I am going to read her newest saga soon...I'll keep you posted. Thanks for rekindling that dreamy romance we've all experienced. I plan to check out this book.